]. The plant is a large, strangling fig that sometimes begins life as an epiphyte, growing in the branch of another tree; as it grows older it sends down aerial roots which, when they reach the ground quickly form roots and become much thicker and more vigorous. They supply nutrients to the fig, allowing it to grow faster than the host tree. 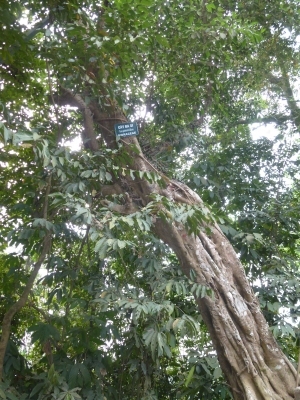 The aerial roots gradually encircle the host tree, preventing its main trunk from expanding, whilst at the same time the foliage smothers the foliage of the host. Eventually the host dies, leaving the fig to carry on growing without competition. The plant is gathered from the wild for local use as a food and source of fibre.